Wikileaks completed its 10 years today, and within this timespan, the whistleblower site has published over 10 million documents, and there’s more to come. In the name of celebration of its 10th Anniversary, Wikileaks promises to leak documents pertaining to Google, United States presidential election and more over the next ten weeks. Speaking by video link to an anniversary news conference at the Volksbuhne Theater in Berlin on Tuesday morning, WikiLeaks founder Julian Assange eagerly announced his plans to release a series of publications every week for the next 10 weeks. 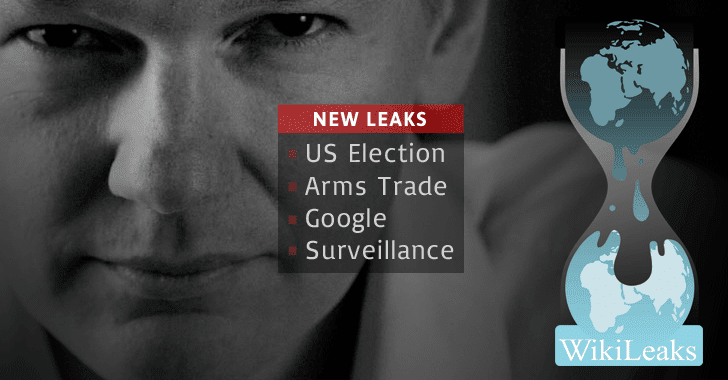 The upcoming leaks will include "significant material" related to Google, the US presidential election, military operations, arms trading and, the hot topic of past few years, mass surveillance. Assange also promised to publish all documents related to the US presidential race before the election day on November 8. "There is an enormous expectation in the United States," Assange said for the forthcoming leaks. "Some of that expectation will be partly answered; but you should understand that if we’re going to make a major publication in relation to the United States at a particular hour, we don’t do it at 3AM." Assange initially planned to announce today’s release from the balcony of the Ecuadorian Embassy in London, where he has been living since 2012 in an asylum for avoiding extradition to Sweden where he is facing sexual assault allegations. But he canceled his appearance, citing "security concerns." When asked whether the upcoming leaks are aimed at damaging the image of US presidential candidate Hillary Clinton, Assange denied the claims, saying some of his statements in this regard had previously been misquoted. "I certainly feel sorry for Hillary Clinton and Donald Trump," Assange said. "These are two people who are tormented by their ambitions, in different ways." You can watch the video of the conference, marking WikiLeaks 10th Anniversary. WikiLeaks has released 10 Million classified documents over past 10 years, among which include documents detailing US military operations in Afghanistan and Iraq, documents relating to the detention of prisoners by the America in Guantanamo Bay, and NSA’s mass surveillance of world leaders.